Election Commission Secretary-General Jarungvith Phumma. 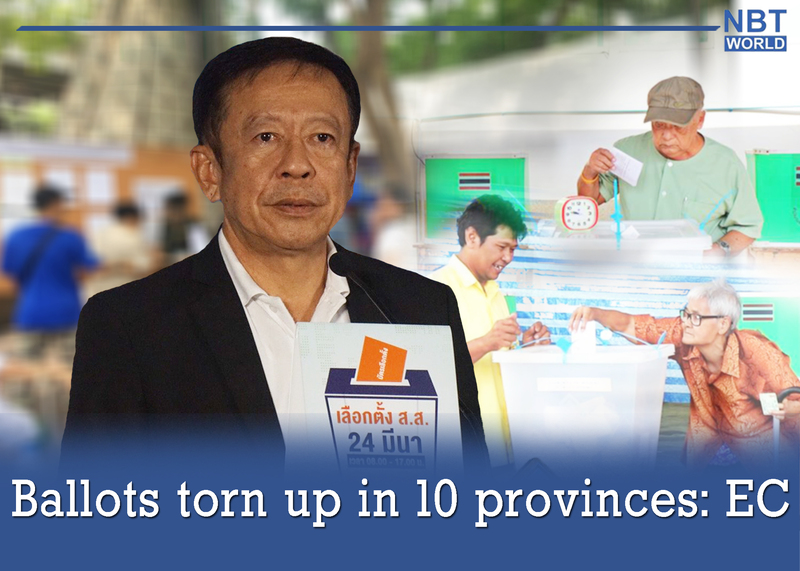 Bangkok – Ballot papers in Sunday’s general election were found torn by eligible voters in 10 provinces, according to Election Commission Secretary-General Jarungvith Phumma. The constituencies in which the ballots were torn to pieces were reported in the provinces of Lamphun, Samut Songkhram, Ayutthaya, Yasothorn, Chiang Mai, Tak, Pathum Thani, Nakhon Sri Thammarat, Ang Thong and Bangkok. In a constituency of Chonburi province, a voter took a picture of his ballot, which was considered an illegal act, the EC secretary general said. A total of 157 complaints have been filed to the polling agency and its branches nationwide, mostly allegedly involving vote-buying activity. In a constituency of Ubon Ratchathani province, two people claimed themselves as the same eligible voter, prompting the authorities to investigate.